Brian Boru now in Annapolis and she will be in the David Walters Yachts Blue Water Boat Show in October. She is one of those really special vessels and it is evident immediately. You will not be disappointed in any way. And her owner wants her sold now as evidenced by the recent price reduction! United Yacht Sales New Jersey would love to guide you through a personal showing of this 51' Bristol 51.1 1987. 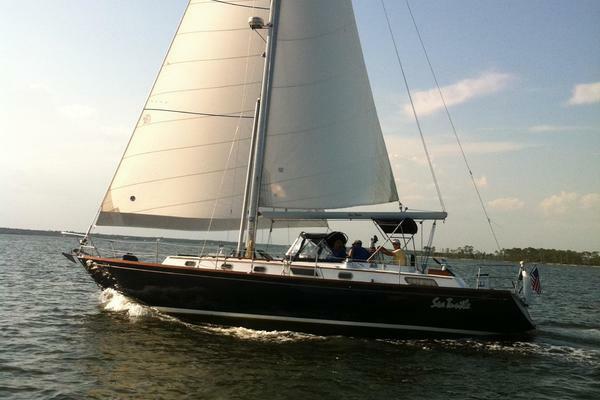 This yacht for sale is located in Annapolis, Maryland and priced at $299,000. For a showing please contact us by filling out the form on this page and we will get back to you shortly! Full Specifications Accommodations The Bristol 51.1 is a beautiful yacht built in a time when an ocean going vessel looked like a real boat with gorgeous Mahagany joinery and sumptuous appointments. Bristol Yachts has always been regarded as the one of the finished builders offering beautiful workmanship. The salon is lovely with seven foot headroom and spacious accommodation. A U-shaped dinette to starboard wraps around a lovely teak dining table. The straight starboard settee can pull out to make a double berth. Storage is abundant with space outboard of the settees as well lockers and outboard cabinetry and bookshelves. The galley is tucked just aft of the salon on the portside with the forward facing navigation station to starboard. The walkthrough to aft cabin provides for generous access to the engine room. Also in the walkthrough just aft of the nav station there are several storage lockers. The master stateroom is the entire private aft cabin with an ensuite head and shower and abundant storage in beautiful cabinetry. This master stateroom is a totally private cabin with the sought after island queen berth. There is storage for everything necessary for extended time aboard. Up forward, the guest cabin has a spacious real V-berth and removable filler that makes a fine double berth instead of two singles. There is a vanity and plenty of storage. The second guest cabin has two single berths, over/under and a hanging locker. These guest cabins share the forward head compartment that has a beautiful separate shower stall. 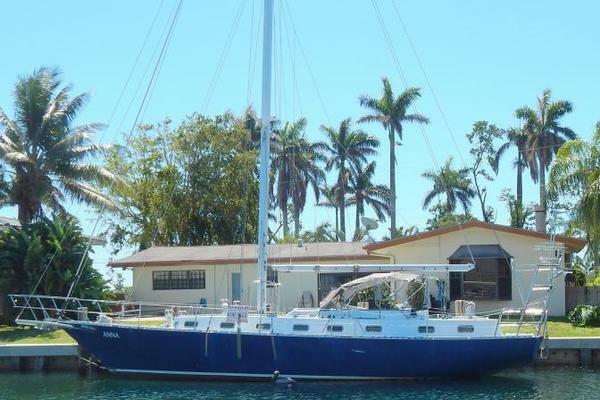 You will be completely comfortable living on this sailing yacht for extended periods with complete amenities. Starboard settee makes a double berth! Galley The large workable galley is located to port at the base of the companionway ladder. It is a very efficient galley that provides offshore safety for the cook in a seaway. The double deep sink is located near the centerline for good drainage on any point of sail. There is lots of storage and good counter space to make life at sea pretty wonderful. 250 gallons of fresh water! Electric toilets in both heads. Hull and Deck Bristol Yachts is well regarded for high quality construction. The hull is solid hand laid fiberglass with a fiberglass sandwich deck. All of the structural bulkheads are glassed both to the hull and deck. All the furniture is built into and tabbed into the hull sides for additional strength The keel centerboard design provides both shallow draft and windward performance when desired.